Chuck Palahniuk is known to write tales not fit for the faint of hearts. From Fight Club to Haunted, his novels are all ridden with dark content, and Diary is no exception. This author is truly not afraid to get down to the nitty-gritty. Diary tells the story of a young woman named Misty Wilmot, who was once an aspiring an artist, but now waits tables in a diner on an island cunningly called Waytansea. Very early in the story we discover that her husband, Peter, is in a coma, after a failed attempt at ending his life. We are told that Misty Wilmot used to live in a trailer park, while attending school to become an artist until of course she met the man who would whisk her away to an island she once believed was a dream paradise, a dream she would often depict in her paintings. This illusion soon vanished once she became a resident of land mass. We see the female protagonist as a mother, living with anger, perhaps caused by her companions attempt at abandoning their family. He was a father and a husband, who in the eyes of his wife is to blame for the state of her own life, leaving her to fend for her and her daughter. During this difficult moment in her life, Wilmot confides to an old friend, painting, and uses her melancholy to create art. The story is presented in the form of a diary. The protagonist writes about the world in a “coma diary” she intends to share with her comatose husband. The first chapter does a wonderful job in capturing the attention of the reader. It discloses the right amount of detail; just enough to get the readers familiarized with characters, and have them wanting more. Each chapter within the novel begins with a complaint made by clients, who have fallen victim to Peter’s botched construction work on their homes, which plays a role in the protagonist’s psyche. One thing a reader can expect while reading a book by C.P. is the inevitable yet unpredictable peripety, which I will not divulge. I really enjoyed reading this book and would recommend it to any who takes a liking to stories with an underlying tinge of horror. Palahniuk, a nihilist in his own right, is known for depicting life in a disparaging manner, and criticizing the different norms in society. He makes reference to despair, death, and human behaviour. He essentially channels the same themes in every one of his book, while using dark satire to express them. 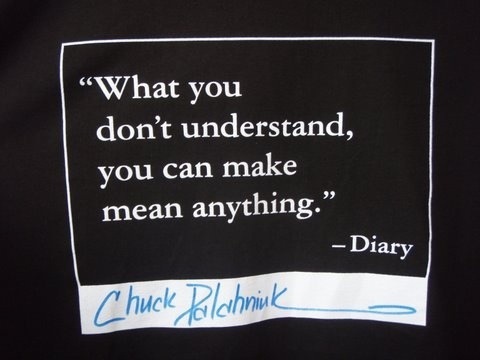 I would like to see Chuck Palahniuk explore other genres and themes. There are only so many times one author can convey the same message, before it becomes redundant and loses meaning. Previous postThe Gay Straight Alliance Is Ready For You!